An old Hasidic rabbi asked his pupils how to tell when night ended and the morning began, which is the time for certain holy prayers. "Is it when you see an animal in the distance and know whether it's a sheep or a dog?" "Is it when you can look at a tree and tell whether it's a fig tree or a pear tree?" "No," the rabbi answered again. After a few more tries, the pupils said, "Then tell us, what is it?" "It is when you can look on the face of any man or woman and know that they are your sister or brother. Until then, it is still night." The important point of spiritual practice is not to try to escape your life, but to face it---exactly and completely. 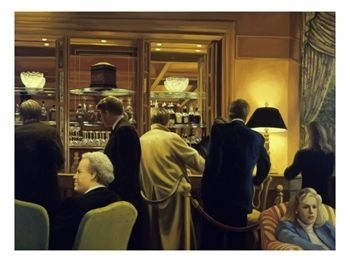 The digital art print is Business and Pleasure by Dale Kennington. What has happened to a civilization when the people decide government itself is an infringement upon their freedom? What is the basis of the belief that nobody can tell me what to do? Is it that rights are determined only by the might and mood of one's neighbor? How is it that a human can assert ownership of any space of ground on this earth? Is it a weapon and money to buy the very best that determines righteousness in this life? What happens when a people are convinced government is the problem, an evil? We had a president in the United States not long ago who said so. We had a Speaker of one house of our Congress who said government workers were worthless, terrible people who should be sent away. How many feel all "bureaucrats" should be eliminated and taxes done away with? How well has this country done, within itself and in the world of nations, after eliminating the process of regulation? Has total reliance upon the "free" marketplace been a triumph? Are we happier being consumers than citizens? Without regulation, who keeps track of outsourcing? Is it even necessary to do, since capitalism is the most perfect way for humans to organize themselves, realize their needs, and celebrate the competitive spirit of innovation? Contractors still build ships and satellites, but they also collect income taxes and work up agency budgets, fly pilotless spy aircraft and take the minutes at policy meetings on the war. They sit next to federal employees at nearly every agency; far more people work under contracts than are directly employed by the government. Even the government’s online database for tracking contracts, the Federal Procurement Data System, has been outsourced (and is famously difficult to use). ¶Competition, intended to produce savings, appears to have sharply eroded. An analysis by The New York Times shows that fewer than half of all “contract actions” — new contracts and payments against existing contracts — are now subject to full and open competition. Just 48 percent were competitive in 2005, down from 79 percent in 2001. ¶Agencies are crippled in their ability to seek low prices, supervise contractors and intervene when work goes off course because the number of government workers overseeing contracts has remained level as spending has shot up. One federal contractor explained candidly in a conference call with industry analysts last May that “one of the side benefits of the contracting officers being so overwhelmed” was that existing contracts were extended rather than put up for new competitive bidding. ¶The most successful contractors are not necessarily those doing the best work, but those who have mastered the special skill of selling to Uncle Sam. The top 20 service contractors have spent nearly $300 million since 2000 on lobbying and have donated $23 million to political campaigns. “We’ve created huge behemoths that are doing 90 or 95 percent of their business with the government,” said Peter W. Singer, who wrote a book on military outsourcing. “They’re not really companies, they’re quasi agencies.” Indeed, the biggest federal contractor, Lockheed Martin, which has spent $53 million on lobbying and $6 million on donations since 2000, gets more federal money each year than the Departments of Justice or Energy. ¶Contracting almost always leads to less public scrutiny, as government programs are hidden behind closed corporate doors. Companies, unlike agencies, are not subject to the Freedom of Information Act. Members of Congress have sought unsuccessfully for two years to get the Army to explain the contracts for Blackwater USA security officers in Iraq, which involved several costly layers of subcontractors. The House Committee on Oversight and Government Reform, whose new Democratic chairman, Representative Henry A. Waxman of California, added the word “oversight” to signal his intentions, begins a series of investigative hearings on Tuesday focusing on contracts in Iraq and at the Department of Homeland Security. David M. Walker, who as comptroller general of the United States leads the Government Accountability Office, has urged Congress to take a hard look at the proper limits of contracting. Mr. Walker has not taken a stand against contractors — his agency is also dependent on them, he admits — but he says they often fail to deliver the promised efficiency and savings. Private companies cannot be expected to look out for taxpayers’ interests, he said. Even the most outspoken critics acknowledge that the government cannot operate without contractors, which provide the surge capacity to handle crises without expanding the permanent bureaucracy. Contractors provide specialized skills the government does not have. And it is no secret that some government executives favor contractors because they find the federal bureaucracy slow, inflexible or incompetent. Stan Soloway, president of the Professional Services Council, which represents government contractors, acknowledged occasional chicanery by contractors and too little competition in some areas. But Mr. Soloway asserted that critics had exaggerated the contracting problems. But the recent contracting boom had its origins in the “reinventing government” effort of the Clinton administration, which slashed the federal work force to the lowest level since 1960 and streamlined outsourcing. Limits on what is “inherently governmental” and therefore off-limits to contractors have grown fuzzy, as the General Services Administration’s use of CACI International personnel shows. “Hi Heinz,” Renee Ballard, a G.S.A. official, wrote in an e-mail message to Heinz Ruppmann, a CACI official, last June 12, asking for six “contract specialists” to help with a backlog of 226 cases that could lead to companies being suspended or barred from federal contracting. The CACI workers would review files and prepare “proposed responses for review and signature,” she wrote. Mr. Amey, of the Project on Government Oversight, which obtained the contract documents under the Freedom of Information Act, said such work was clearly inherently governmental and called it “outrageous” to involve contractors in judging the misdeeds of potential competitors. CACI had itself been reviewed in 2004 for possible suspension in connection with supplying interrogators to the Abu Ghraib prison in Iraq. The company was ultimately cleared, though the G.S.A. found that CACI employees had improperly written parts of the “statements of work” for its own Iraq contract. The price of $104 an hour — well over $200,000 per person annually — was roughly double the cost of pay and benefits of a comparable federal worker, Mr. Amey said. Asked for comment, the G.S.A. said decisions on punishments for erring contractors “is indeed inherently governmental.” But the agency said that while the CACI workers assisted for three months, “all suspension/debarment decisions were made by federal employees.” A CACI spokeswoman made the same point. The G.S.A., like other agencies, said it did not track the number or total cost of its contract workers. The agency administrator, Lurita Doan, who previously ran a Virginia contracting firm, has actively pushed contracting. Ms. Doan recently clashed with her agency’s inspector general over her proposal to remove the job of auditing contractors’ proposed prices from his office and to hire contractors to do it instead. On some of the biggest government projects, Bush administration officials have sought to shift some decision making to contractors. When Michael P. Jackson, deputy secretary of the Department of Homeland Security, addressed potential bidders on the huge Secure Border Initiative last year, he explained the new approach. If the government is exporting some traditional functions to contractors, it is also inviting contractors into agencies to perform delicate tasks. The State Department, for instance, pays more than $2 million a year to BearingPoint, the consulting giant, to provide support for Iraq policy making, running software, preparing meeting agendas and keeping minutes. That blending is taking place in virtually every agency. When Polly Endreny, 29, sought work last year with the National Oceanographic and Atmospheric Administration, she was surprised to discover that most openings were with contractors. “The younger generation is coming in on contracts,” said Ms. Endreny, who likes the arrangement. Today, only the “Oak Management” on her ID badge distinguishes her from federal employees at the agency’s headquarters. The shift away from open competition affects more than morale. One example among many: with troops short in Iraq, Congress in 2003 waived a ban on the use of private security guards to protect military bases in the United States. The results for the first $733 million were dismal, investigators at the Government Accountability Office found. Mr. Soloway, of the contracting industry group, argues that the contracting boom has resulted from the collision of a high-technology economy with an aging government work force — twice as many employees are over 55 as under 30. To function, Mr. Soloway said, the government must now turn to younger, skilled personnel in the private sector, a phenomenon likely to grow when what demographers call a “retirement tsunami” occurs over the next decade. But Paul C. Light of New York University, who has long tracked the hidden contractor work force to assess what he calls the “true size of government,” says the shift to contractors is driven in part by federal personnel ceilings. He calls such ceilings a “sleight of hand” intended to allow successive administrations to brag about cutting the federal work force. Yet Mr. Light said the government had made no effort to count contractors and no assessment of the true costs and benefits. “We have no data to show that contractors are actually more efficient than the government,” he said. Meanwhile, he said, a potent coalition keeps contracting growing: the companies, their lobbyists and supporters in Congress and many government managers, who do not mind building ties to contractors who may hire them someday. “All the players with any power like it,” he said. That is evident wherever in Washington contractors gather to scout new opportunities. There is no target richer than the Homeland Security Department, whose Web site, in a section called “Open for Business,” displays hundreds of open contracts, including “working with selected cities to develop and exercise their catastrophic plans” ($500,000 to $1 million) and “Conduct studies and analyses, systems engineering, or provide laboratory services to various organizations to support the DHS mission” ($20 to $50 million). One crisp morning in an office building with a spectacular view of the Capitol, Alfonso Martinez-Fonts Jr., the agency’s assistant secretary for the private sector, addressed a breakfast seminar on “The Business of Homeland Security.” The session drew a standing-room crowd. Mr. Martinez-Fonts, a banker before joining the government, said he could not personally hand out contracts but could offer “tips, hints and directions” to companies on the hunt. Hey maybe it's a different kind of bomb, only the Decider knows for sure! (Did you hear the guy imitating Bush on Garrison's Joke Show this weekend mistakenly pronounce "nuclear" correctly, and then miscorrect himself? Funniest part of the whole show!) Anyway, I don't see much response to the outsourcing article posted on Sunday. Maybe everybody in the Northern Hemisphere is too cold to read and think...or maybe the moves away from having a congress for citizens, and toward "signing statements" and freedom of the marketplace for consumers finally are kicking in. Paul Krugman responded though. If your memory hasn't frozen up you know he writes about economics and international trade twice a week for The New York Times. Wikipedia says, " Krugman (pronounced with a long U) was born and grew up on Long Island, and majored in economics (though his initial interest was in history) as an undergraduate at Yale University. He obtained a Ph.D. from MIT in 1977 and taught at Yale, MIT, UC Berkeley, the London School of Economics, and Stanford University before joining the faculty of Princeton University, where he has been since 2000." You have to buy the paper or pay a fee to read his columns online though. TruthOut is putting up some of them, including yesterday's about outsourcing in which he says America has been returned to the 19th century spoils system. Not to be missed! Its author is Frida Berrigan (berrigaf@newschool.edu), a Senior Research Associate at the World Policy Institute's Arms Trade Resource Center. Her primary research areas with the project include nuclear-weapons policy, war profiteering and corporate crimes, weapons sales to areas of conflict, and military-training programs. The scary title is Privatizing The Apocalypse, and reveals how the arms industry has taken over setting up the The Big One. It's at http://www.tomdispatch.com/index.mhtml?mm=3&yr=2006 where she's written a few more essays during the last year. I think I'll put another log in the stove, settle in and get acquainted with her research. Which means it will have to be read soon and this note is an acknowledgement to do so. To later. Nraye.